Happy St. Paddy’s Day from Ireland! Well, readers, today’s the day we’ve all been waiting for: St. Patrick’s Day in Ireland. It’s only 8 a.m. here, but the city is already abuzz with excitement and I’m so excited to tell you all about what I do today! The simple fact that I’m here in Ireland for St. Paddy’s Day is something many people wish to check off their bucket list at some point in their lives. Who wouldn’t want to be in the country that started the ball rolling for the rest of the world? Well, from what I’ve been told, the locals, that’s who. Apparently the locals don’t stick around to celebrate this famous holiday. Sure there are parades and parties, but most of my professors and their families avoid the city in lieu of tourists. Well, today I’m deciding to be that tourist and go experience the millions of activities the city has to offer. My tentative plan for today is to go to the Parade that’ll go through the city center. It’s not supposed to be to the huge scale of New York or Chicago’s parade, but it’ll be authentic and something to behold nonetheless. After the parade, some friends and I are planning to go to the Hurling and Gaelic football finals in Croke Park. It’ll be fun because none of the teams that are competing have ever been in the finals before, so the crowd will be crazy with excitement. Then, I think it’s an obligation to go to a pub and experience some live music before heading home. You can check out the full list of events this weekend here, as St. Paddy’s Day is an all weekend event! I’ll be sure to give exact details and pictures in my next blog. 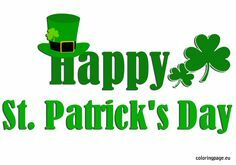 Happy St. Paddy’s Day from Ireland – enjoy with whatever your special traditions are!